Mauritanian army officers have announced the overthrow of the country's president and creation of a military council to rule the country. 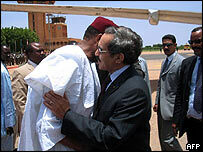 The council said it had ended the "totalitarian regime" of Maaouiya Ould Sid Ahmed Taya, who is now in Niger. It named security chief Col Ely Ould Mohammed Vall as the new leader. There were street celebrations in the capital, Nouakchott, as troops controlled key points. African and world bodies condemned the action. The African Union said it "strongly condemns any seizure of power or any attempt to take power by force". UN Secretary General Kofi Annan was "deeply troubled" by the reports, insisting political disagreements should be settled peacefully and democratically, a spokesman said. President Olusegun Obasanjo of regional powerhouse Nigeria said "the days of tolerating military governance in our sub-region or anywhere" were "long gone". President Taya, attending the funeral of Saudi Arabia's King Fahd at the time, was flown to Niger's capital, Niamey. He was met by Niger President Mamadou Tandja before travelling on to a villa in Niamey, where officials say he may stay for several days, the Associated Press reports. The new Military Council for Justice and Democracy said it would rule the West African state for a transitional period of two years, after which it would organise free and fair elections. Following the announcement on national radio, people took to the streets of Nouakchott in celebration, hooting their car horns. "I can hear the cars now and people running in the streets. People are celebrating," resident Hassan Ahmed told the BBC's Focus on Africa programme. Heavily armed forces surrounded state radio and television buildings as well as the presidential palace from 0500 GMT. State media broadcasts were cut and the airport closed. Some sporadic gunfire was heard at first, and there were unconfirmed reports of senior army officials being arrested. Shops immediately shut down and civil servants left their offices, said witnesses. Rebel soldiers came close to toppling Mr Taya in June 2003. The government said it foiled two more attempts in 2004. President Taya took power in a bloodless coup in December 1984 and has been re-elected three times since. Correspondents say he later made enemies among Islamists in the country, which is an Islamic republic. Critics accuse the government of using the US-led war on terror to crack down on Islamic opponents. Mr Taya has also prompted widespread opposition by establishing links with Israel. Earlier this year, nearly 200 people, including former President Mohamed Khouna Ould Haidallah, were put on trial for a series of alleged coup plots. Mauritania is deeply divided between three main groups - light-skinned Arabic-speakers, descendents of slaves and dark-skinned speakers of West African languages.